Join us on the Paddlewheeler Creole Queen for one of our delightful and festive holiday season cruises! Let your imagination set sail on the Cajun Holiday Tea with Papa Noel and all of his friends or take in an elegant evening with Caroling on the River. Ring in the 300th anniversary of the city of New Orleans with the best seats to the Fireworks on the River show! These family-friendly cruises are the perfect way to celebrate the seas wnoith a uniquely New Orleans experience. Come pass a good time aboard the Paddlewheeler Creole Queen with Papa Noel, Mrs. Noel, Gaston the Gator and other jolly Cajun characters during this enchanting family festivity. Enjoy a classic holiday tea with tempting treats, storytelling, and more! 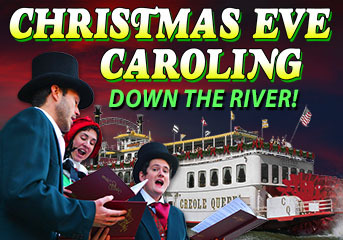 Spend an enchanting Christmas Eve on the Creole Queen! Enjoy unparalleled views of the city from our elegant, garland-adorned dining rooms or from the open air of our upper deck. Have a true Christmas New Orleans style experience with a delicious Creole dinner and a live jazz band. Celebrate New Year’s Eve in New Orleans aboard the Paddlewheeler Creole Queen! Ring in 2018 with a front row seat to the fireworks extravaganza over the Mississippi River.